There�s a funny adage about bad pennies. That�s that they keep turning up. However, when we�re talking about Rush Limbaugh, the de facto head of the Republican Party, equating him to a penny presumes that he�s worth far more than he is. Because our boycott of his advertisers have hurt him and his brand, he has unveiled a new tactic: paying women to objectify themselves and for attacking other women. As far as knighting Limbaugh the de facto head of the Republican Party, if this were the case, he would not have had to bail out of the primaries. Because he has an unfiltered big mouth, the media loves him. He loves himself. Clearly, the Republicans do not. Can we just send him a plane ticket to the middle of the Gobi desert with a bottle of his beloved Viagra and another bottle of his adored Vicodin, one glass of water and no sun screen? Can we, huh? PLEASE!!!!!!!!!!!????? I'd love to see Rush refer to some of the women who frequent this site as "Babe," much less a "Rush Babe." I can think of a couple dozen who'd be willing to assist each other in forcing his head up his rectal cavity. Rush doesn't seem to know the difference between a real woman and a bimbo. Or maybe he treats real women with such disrespect because he finds them intimidating. The thought of having to scrape his own excrement from his head will make him forget about cleaning that giant snot from his finger. Ok, TomCat, what are you trying to do to your audience today? First, Monster Mittens. Second, Raunchy Rush. And third, Susanne is making me choke with laughter on one of your threads yesterday and today. How in the world would any woman want any part of this moron, A real look alike picture of Rush, He is a pig, Sorry to the real pigs!! Not even a female cockroach would want to associate with this slime ball. I thought it oddly quiet without hearing something about Rush Limbaugh. Now here he comes again! I agree with Lawrence O'Donnell and Krystal Ball --- Rush is running scared! Somebody at Care2 said send him to the Gobi Desert with his viagara and a glass of water. Would the Chinese and Mongolians love that! 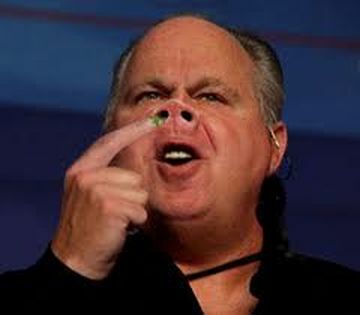 How fitting this picture of Rush Limbaugh, the American pig! Thank you TomCat! This thread, as well as the accurate and appreciated posts by all whom I respect brings a huge smile to my face. I am sharing with someone whom feels differently and suggest you all tighten your seat belts. I predict an *E-Ticket* ride! "I can't understand how ANY woman could stand to listen to Ru$h - but then I think of Palin & Bachmann, and Coulter..."
Susanne forgive me for not acknowledging your post. BRILLIANT, as usual. Why insult pigs by comparing them to this fat heartless deranged piece of disgusting worthless demented crap? Why insult pigs by comparing them to breitbart.com? Perhaps it's because Rush "Oxycontin" Limbaugh is their biggest idol over at dullwit breitbart. Mahalo. What an insult to the real pigs that I just love. Good picture, anyway, Tom. Have you ever held a piglet in your arms? I have, on my sister's farm in Indiana. They are the cutest. "Your best course of action is to put boycotting this misogynist misanthrope back in the front burner. Visit StopRush.net for an update of his sponsors. Call the ones in your area and tell them that you will not give them your patronage because of their support of Limbaugh. If they are companies with whom you have done business, make sure they know it." but he has to pay women for ANY support: Rush was offering "free Ipads to people who would retweet him". Does the Armed Forces Network still carry Rush? INSULTING ALL WOMEN IN THE MILITARY? Rush SCUMbaugh has such a fitting picture! Why would any woman with a brain choose to marry such a BIGIIDIOT? Perhaps she'll grow a brain and realize what scum he is all about! Its over for this giant bag of fart gas. They fired Imus for similar reasons, but this putrid hater is going to just fade out of all memory as the pathetic nothing that he is, taking the entire TEAbag GOP with him. He is responsible as much as all the worst of them for their demise. What a patriot. scary well done picture of the beast, Tom! Great comments everyone! Sending a Green Star is a simple way to say "Thank you"
You cannot currently send a star to BMutiny because you have done so within the last week. BM I am huge on boycotting. ThankX for the link...looking it up right now! I agree with all whom said it is an insult to pigs! You've got to admit, the photo suits him! Green stars to BMutiny ans SuSanne. YES Boycott Rush. I will call some sponsors in the morning. How many months must we endure Mittens? Is there any way to boycott the presidential candidate? Call Koch Industries and tell them you won't buy dixie cups? Don't I wish. I have boycotted him (Rush) for many years.